The global under-five mortality rate has fallen by 53 percent, from 91 deaths per 1,000 live births in 1990 to an estimated 43 in 2015(1).This progress, while remarkable, fell short of the Millennium Development Goal 4 (MDG 4) target of a two-thirds reduction in the under-five mortality rate (1). Of the 10.6 million yearly deaths in children younger than age 5 years, pneumonia accounts for 19% of them (2).Therefore, the World Health Assembly passed a resolution recognizing pneumonia as the world’s leading infectious killer of children and made pneumonia a global health priority (3).In developing countries, severe pneumonia is diagnosed by a rapid breathing rate/chest indrawing and general danger signs (4) and case management remains the cornerstone of pneumonia control strategies (5). In absence of chest X-ray facility, pneumonia is diagnosed by the presence of rapid breathing/chest indrawing (6).However, chest indrawing, a clinical sign of hypoxemia (7), is associated not only with pneumonia but also with sepsis (8), and more so when accompanied by malnutrition (9). It is known that the majority of childhood pneumonia deaths are due to severe pneumonia; management of these cases requires early identification, prompt referral and the availability of good-quality higher-level care (10). The present study was performed to know if the problem of rapid breathing/chest indrawing with general danger signs, severe pneumonia, could be addressed by an all-inclusive treatment that covers sepsis and/or impaired perfusion in particular. Setting: The subjects were the admissions to the Pediatric Intensive Care Unit (PICU) of B.J Medical College and Sassoon General Hospital, Pune. Data collection: The details of 616 consecutively admitted critically ill children, 370 (60%) of whom had severe pneumonia, were prospectively recorded over a period of one year. Data collected included demographic information, management, and outcome. Following clinical features were prospectively recorded in a pre-determined format: age, gender, nutritional status; by weight-for-age criterion of the Indian Academy of Pediatrics (11), fever, signs of shock and chest indrawing. Following investigations were performed: full blood counts, blood gas analysis on peripheral venous blood (12) and chest X-ray. Consolidation on chest X-ray indicated “radiological pneumonia”. The X-ray was interpreted by the pediatric unit team that arrived at the diagnosis of consolidation by consensus. The white cell count met the Systemic Inflammatory Response Syndrome (SIRS) criteria when leukocyte count was more than 15000/dl or was less than 5000 /dl or when absolute band count was more than 500/dl (13). ELISA test for HIV infection was carried out when social history indicated a risk. Pulse oximetry was not included in the study since only one oximeter was available and was not hand-held or easily portable. The remaining admissions were for other ailments such as newborns re-admitted for severe jaundice or suspected sepsis and admissions for complications of underlying systemic illnesses without pneumonia-cardiac-56(9.1), respiratory-74(12%), neurological 62(10.1%),renal 8(1.3%), HIV infection 43 (7%), hepatobiliary 12(1.9%). Severe pneumonia (figure 1), as defined by the WHO (4), is the main focus of this study. Its management included antibiotic and oxygen administration. The subjects with decompensated shock also received fluid bolus and inotropes, and those with compensated shock received only inotropes. The inotropes were administered in a combination of adrenaline 0.1mcg/kg/min and dobutamine 10 mcg/kg/min. Ringer’s lactate was administered as a bolus, 20 ml/kg over 30 min to begin with, faster or slower, if necessary. The bolus was repeated depending upon the severity of shock and the response to the first bolus. In cases of severe malnutrition the initial bolus was of 10 ml/kg and repeated, if needed, with extreme caution. Short-term respiratory support was possible using the bag and mask ventilation. The facility for mechanical ventilation was not available. There were few who could afford to go to centers with mechanical ventilation since they were in private sector. Definitions* (1) A patient was assessed as critically ill in presence of chest indrawing and any of the general danger signs; and/or signs of shock and/or altered conscious level persisting beyond two hours of cardio-respiratory stabilization, with or without convulsions. The patient qualified for admission to PICU. 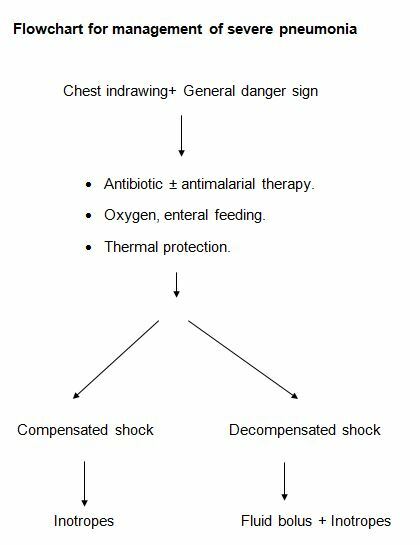 (2) Compensated shock was diagnosed in presence of at least three of the following clinical signs: weak pulses, cool peripheries, rapid breathing/chest indrawing and semi-conscious state. (3) Decompensated shock was diagnosed when a child had impalpable pulses, cold peripheries, unconsciousness and gasping respiration. *Adapted from 2005 American Heart Association Guidelines for Cardiopulmonary Resuscitation and Emergency Cardiovascular Care. Part 12: Pediatric Advanced Life Support. Analysis: The outcome variable of interest was survival to hospital discharge or death. Binary Logistic Regression between ‘outcome’ as the dependent variable and a set of independent (predictor) variables was performed. Approval was obtained for this study from the Institutional Ethics Committee of the B.J. Medical College and Sassoon General Hospital, Pune. Of the total 616 admissions, 140 (22.2%) expired. The profile of admissions is given in table 1. Of the 616 admissions, 370 had severe pneumonia. 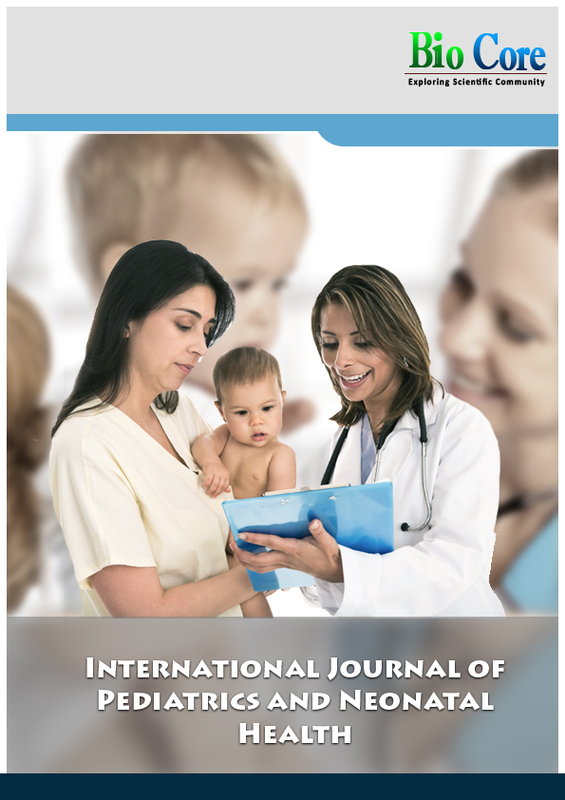 The frequency of commonly known predispositions/associations of sepsis and/or impaired perfusion among children with chest indrawing was as follows (table 2): infancy (52.4%), Protein Energy Malnutrition (PEM ) (78.4%); of which, severe PEM (grade lll and lV) were 208 (33.8%), shock (19.5%), dehydration (15.5%), fever (75.4%), altered conscious level (15.9%), convulsions (9.2%), oliguria (3%), HIV infection (6.8%),sepsis on blood counts (40%) and pH <7.3 (37.7%). Table 4: Characteristics of children associated with outcomes of pneumonia. We have studied a representative sample of children who may present at the receiving room of a hospital in a developing country that included young infants; severely malnourished children or children diagnosed with HIV infection. Like the majority of pediatric referral centers in developing countries, our center too had no mechanical ventilation facility and adequate nursing staff. In this study, the chest indrawing did not carry a higher risk of death. This observation supported the modified classification of the World Health Organization (WHO) that recommended home treatment of chest indrawing. Shann observed a higher risk of death with chest indrawing (14). This observation had formed the basis for the earlier guidelines of the WHO for severe pneumonia diagnosis and management (15). The new evidence generated from research carried out in the last decade, including in those low- and middle-income countries led to revised definitions and simplified treatment (4). The median prevalence of hypoxemia in pneumonia requiring hospitalization has been 13% (16). Therefore, the potential for reducing pneumonia-related deaths in health facilities is greater when oxygen administration is included in the core activities (17). Globally, the deaths due to pneumonia have not declined on expected lines (1). This problem may be addressed by a two-pronged approach: one for pneumonia and the other for severe pneumonia, keeping in mind that pneumonia is far more common than severe pneumonia. Pneumonia may be addressed by wider implementation of the current guidelines built around core activities such as training, antibiotics and oxygen, and paying attention to implementation challenges. Equally important is to remove the bottlenecks that impair the access and act as programmatic barriers (18). These measures have the potential to reduce mortality from pneumonia by 70% with the current case management strategies (19). The current management of severe pneumonia needs to be strengthened for the referral to be meaningful. One aspect of care that may be addressed is the cardiovascular dysfunction and circulatory insufficiency that is observed in these cases (20, 21). This may probably be due to accompanying sepsis since we found that dehydration, sepsis on blood counts, and pH less than 7.3 were significant predictors of adverse outcome. A circulating myocardial depressant substance is responsible for this effect and it correlates quantitatively with the decrease in left ventricular ejection fraction. The patients who have inadequate stroke volume despite adequate volume loading have reduced contractility. Stroke volume is greater in patients treated with inotropic therapy compared with those left untreated (22). This justifies the use of inotrope therapy for those with compensated shock in our management protocol. In the present study, clinical criteria suggested by the American Heart Association in 2005 (23) have been adopted for recognition of shock. However, the fluid resuscitation in lower and middle-income countries is extremely challenging, especially in malnourished children. Echocardiography and Doppler studies indicate animpaired ventricular function in malnourished children. A particular care with the fluid administration is imperative in the therapy in malnourished children where heart function may be compromised (24). The WHO/CHNRI Expert Group on Childhood Pneumonia recognized the need to identify the main gaps in the prediction of severe pneumonia that requires hospitalization and also, an improvement in the existing interventions in a developing country set up (25).The present study suggests that the recognition of circulatory insufficiency and prompt circulatory support may bridge this gap. The group also recognizes the need to identify diseases that mimic the presence of pneumonia and, sepsis is the disease that may clinically mimic pneumonia (26). Our study is deficient on two counts. The diagnosis of sepsis is not based on the gold standard, the blood culture. Secondly, this study is not a randomized controlled trial to establish the effectiveness of circulatory support for cases of severe pneumonia where a group with circulatory support is compared with a group without circulatory support, To sum up, the case management of severe pneumonia needs to be strengthened by detecting and treating associated sepsis and/or circulatory insufficiency.